Fed Chair Jay Powell may have picked a bone with the markets by doubling down on the central bank’s plans to continue shrinking its balance sheet. Minutes into his press conference on December 19, Powell was asked if the Fed is looking into altering its strategy of undoing quantitative easing by allowing its massive holdings of Treasurys and mortgage-backed securities to mature off the balance sheet. “I think that the runoff of the balance sheet has been smooth and has served its purpose and I don’t see us changing that,” Powell said, adding that interest rates would continue to be the “active tool of monetary policy.” When Janet Yellen kicked off the unwind process at the end of 2017, the Fed outlined its intention to let the roll-off occur on “auto-pilot” with no promise of reverting back to quantitative easing — unless there were a “sufficient” negative shock to the economy. After those remarks, the Dow Jones dipped over 300 points as investors started to worry that the Fed’s commitment to “quantitative tightening” added hawkish undertones to a market looking for a dovish 2019. As of 1:12 p.m., the S&P 500 had been down 1.56% to 2,468.34 and the Dow Jones Industrial Average was down 1.83% to 22,896.12. “The amount of runoff that we have had so far is pretty small and if you just run the quantitative easing models in reverse, you would get a pretty small adjustment in economic growth, and real outcomes,” Powell said. Not everyone is convinced that the Fed’s $50-billion-per-month pace of asset roll-offs is as benign as Powell says it is. 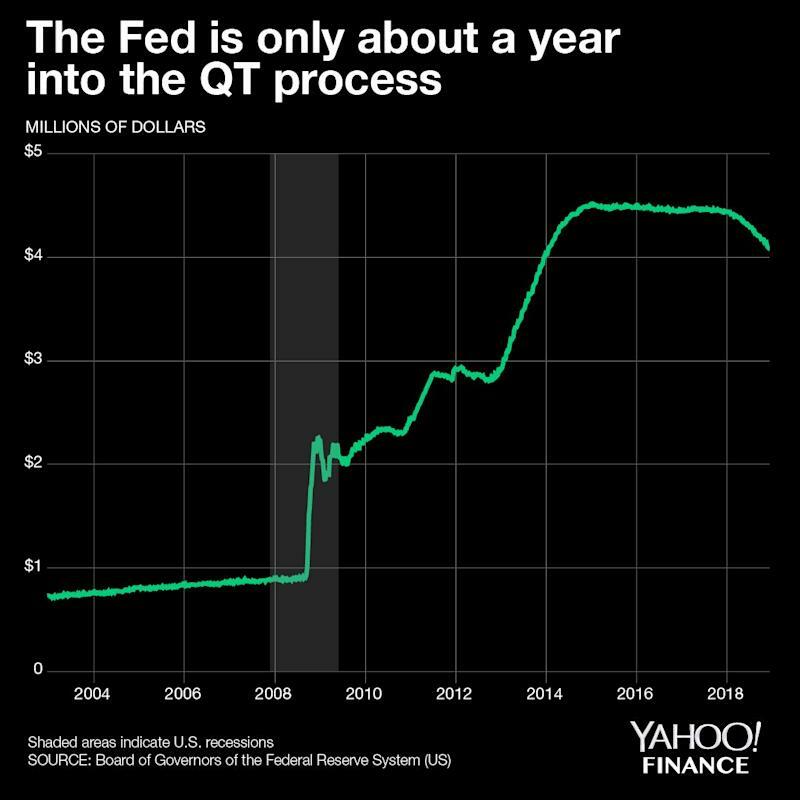 “It’s almost as if the Fed has made up its mind that the balance sheet unwind is painless,” Quincy Krosby, Prudential’s chief market strategist, told Yahoo Finance. Powell’s unwavering stance on the “autopilot” process of quantitative tightening speaks to the Fed’s broader interest in normalizing monetary policy. Even though the Fed dialed back its projections on 2019 rate hikes from three to two, Powell expressed his desire to wean the economy off of “accommodative” policy and get the economy to its neutral run-rate. But leading up to Wednesday’s meeting, skeptics argued that the data — which the Fed said is its lodestar — should have dissuaded policymakers from pursuing tighter monetary policy. Investor Stan Druckenmiller, former Fed Governor Kevin Warsh, and President Donald Trump cited slowing global growth and concerns over liquidity in urging the Fed to not only pause rate hikes, but also reconsider its balance sheet unwind process. Those hoping for more flexibility in quantitative tightening and even fewer 2019 rate hikes were probably disappointed by Wednesday’s FOMC decision. “[O]ne area where he firmly batted down expectations of a dovish turn was balance sheet normalization: he dismissed any idea that they were contemplating using the balance sheet to respond to incoming data,” JPMorgan Chase’s Michael Feroli noted. Morgan Stanley pointed out that the market reaction gives the Fed reason to rethink. “The negative market reaction to Powell’s balance sheet comments was quite stark, however, and they may have been enough to catch policymakers’ attention and lead them to reconsider their normalization plans,” Morgan Stanley noted. But the Fed maintained that it will remain data-dependent as it navigates 2019, a year that Powell admitted “may not be as kind to our forecasts” as it was this year. Powell acknowledged “tightening financial conditions” and the Fed did revise down its expectations on 2019 GDP growth — from 2.5% to 2.3% — and core inflation for this year — from 2.0% to 1.9%. But by still raising rates and insisting that the unwind will continue on “autopilot,” Powell is telegraphing two main points: the economic outlook isn’t that bleak and markets should de-emphasize the potency of its policy. “Monetary policy will be providing a smaller boost to the economy in 2019,” Powell said.